VMware offers different supported ways (from manual to fully-automated) to patching and upgrading your current vSphere infrastructure. Depending on what version and products are installed in your environment, the correct choice will be different . 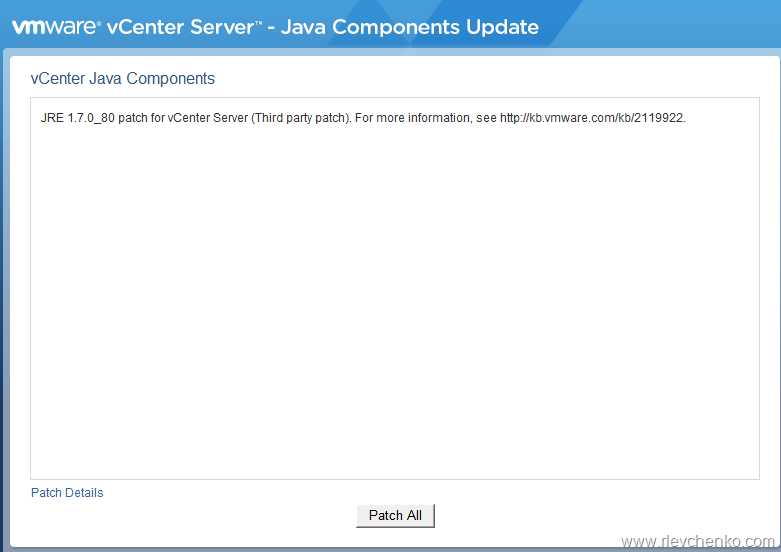 If you already have vCenter Server on your site, vSphere Update Manager (VUM) is the most recommended method. With VUM you can patch and upgrade ESXi hosts (version 5.0 and later), VMware tools, VM hardware and even some of virtual appliances. VUM integrates with vCenter and it’s services such as Distributed Resource Scheduler (DRS) or Distributed Power Management (DPM). That kind of integration eliminates downtimes and interruptions of your applications during migration or upgrading vSphere components. The old (but it’s still on a board) vSphere desktop client (or just “C# client) was the preferable way to manage VUM functionality. VUM integration with web client was badly limited. But starting from vSphere 6, web client is becoming the preferable way to manage your entire environment. In the vSphere 6 CU1 VUM has been FULLY integrated to web-client. So, C# client is not necessary and, by the way, it’s going to be deprecated after the next major vSphere release. Let’s say “thank you and bye, bye” . VUM requires SQL Server of Oracle database. Update Manager can handle small-scale environments using the bundled SQL Server 2012 Express . Medium and large environments (from 5 hosts and 50 VMs) requires individual database server which is separated from vCenter database. To specify placement and additional requirements, I strongly recommend to use vSphere Update Manager Sizing Estimator (simple XLS-file). Depending on hosts and virtual machines number, this tool generates recommendations for VUM’s disk space utilization size and database server arrangement (see the picture below). VUM bits are only available as the part of windows-based vCenter ISO. Download it and mount before installation. VUM installation is straightforward. Mount ISO with Windows-based ISO, go to VUM section and select Server. I will use embedded database based on SQL Server 2012 Express and Windows Server 2012 R2 (as mentioned earlier , database placement and version really depends on your environment size, so carefully plan this step). Define vCenter FQDN or IP, ports leave with default values (if you don’t have special own requirements). All steps are shown on the pictures below. 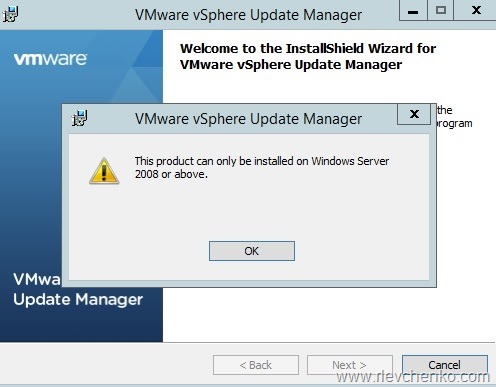 Note: you may notice the additional option under vSphere Update Manager installation : Download Service. Download service is very helpful when you are planning to deny external access on VUM machine and download updates from different machine, which can be located in DMZ as well. Additionally, it’s recommended to deploy Download Services separately when you have multiple vCenter instances and therefore many VUMs. In this case, VUMs downloads updates and patches from centralized repository. Download Services thus essentially reduces incoming external traffic. TIP: to upgrade from previous VUM version you need to choose “Yes, I want to upgrade my Update Manager database and I have taken a backup of the existing Update Manager database” option on the database upgrade page. VUM 6.0 supports upgrades only from VUM 5.x . So, if you have VUM older that 5.x, you need to migrate it to 5.x and then to 6.0. Also keep in mind that VUM 5.x and 6.0 requires 64-bit OS. Click on this icon and the list of installed VUMs will be shown at the next window. Then just click on VUM’s IP to manage it’s properties. Before you start VUM’s configuration you need to understand it’s terminology that based on baselines, remediation and compliance. Baselines are set of patches and upgrades. VUM uses them to keep your hosts , VMs, VA up-to-date. Set of baselines is called as “Baseline group”. There are two different baseline’s type – dynamic and fixed. Dynamic baseline downloads all updates and patches that meets predefined criteria. If you go to Manage-Host Baselines you will see 2 pre-built dynamic baselines. To get criteria’s value , right click on one – Edit baseline – Criteria . In the other hand, fixed baseline contains added specific patches from repository. It does not download any others. It’s just fixed. Can be used when you want to manually add list of unique patches and attach them to hosts. All baselines, created by default, are Dynamic. You can add more than one baseline and merge them into baseline groups. Then this baseline group need to be attached to hosts/VMs or VA to scan updates and getting compliance status. The compliance statuses of objects can be All Applicable, Non Compliant, Incompatible, Unknown, and Compliant. If compliance status is unknown , it means that Update Manager does not have any information about these objects attached to individual baselines or baselines group. In my case , compliance status is Compliant. So, my hosts are up-to-date and have all updates that linked to the attached baselines. If you have hosts with non-compliant status, it’s time to start remediation. You can set download options, schedule, network parameters and etc. I’m not going to review all of them. Let’s talk about the most interesting. As you know, vApp is a “special” resource pool and collection of VMs with specific dependencies. 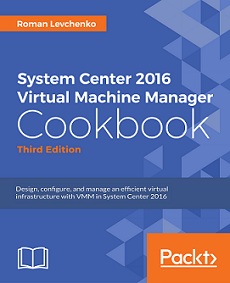 (for example, Virtual Machine Manager , SQL Server and Active Directory). And in that way VMM cannot work without SQL Server and Active Directory. Let’s assume VUM want to update SQL Server in this vApp and reboot is required after updating. If SQL Server becomes unavailable, VMM services don’t work too. So, VUM “smart reboots” not only SQL Server but and VMM as well (delay is on. VUM waits while critical service is up (in our case, SQL Server) and reboots other services with dependencies). More simply, VUM uses vApp startup settings. 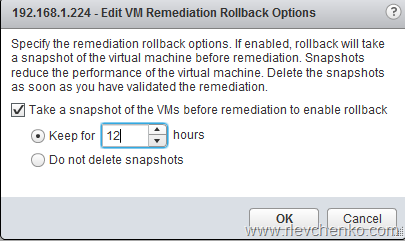 Before remediation of VMs , VUM can take snapshots and keep them for the specified time interval or do not delete them at all. In production environments snapshots can be the reason of poor storage performance. So, it’s not a good idea to leave the default “do not delete snapshots”. Check for updates , remediate host , in 12-24 hours check that all guest services are working as required and manually delete snapshots then. have a nice working days!